One thing I constantly miss during the early stages of the Dukan Diet is Asian take-out, and my weakness is Thai food. To help I like to recreate my favorite Thai dishes at home where I have control of the ingredients. 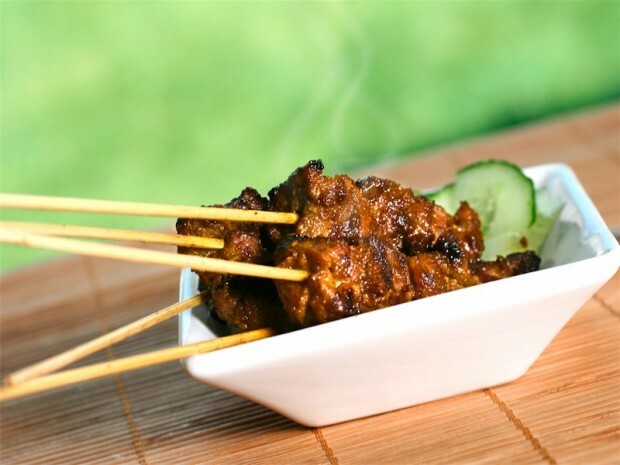 This simple recipe is a take on traditional Beef Satay using an Asian inspired marinade. During later phases you can also thread veggies on the skewers as well. Peppers, onions, and squash work great. 1. In a bowl mix together the soy sauce, vinegar, sesame oil, fish sauce, mirin, garlic cloves, ginger, Stevia, lime juice, and the red pepper flakes. 2. Add meat and marinate over night. 3. Thread the meat onto the skewers (about 4 per skewer) and then grill for about 3 minutes per side or until cooked to your liking.